More than $7 million is available to update the courthouse at Tulane and Broad. Bunton’s office receives a portion of every traffic camera fine, along with portions of court fines and fees. According to his presentation at Wednesday budget hearing, fines and fees accounted for $2.7 million in revenues this year, or 36 percent of the Orleans Public Defenders’ year-to-date budget. Of that, traffic camera fines brought in $1.3 million. But Bunton has long criticized this so-called “user pay” system for funding public defenders. He’s lobbying for more direct appropriations from the city’s general fund in order to help make up potentially lost traffic camera revenue, which he estimates at $300,000. While Cantrell’s budget calls for increases for police and prosecutors, it holds direct city funding for the defenders office steady at about $1.5 million. At his office’s budget hearing on Wednesday, Bunton told the City Council that under the current budget, his office will be forced to implement a hiring freeze and stop accepting some cases when the new year begins. Traffic safety or revenue generator? While the enhanced traffic enforcement program will expand the number of officers patrolling for traffic violations, it will also increase the fines they dole out. For 11 different traffic violations, including improper turns and tailgating, NOPD officers have the option to issue either a municipal violation or a state-law violation. State violations carry a steeper fine. In some cases, the state fine is nearly double the size of the municipal one. Currently, NOPD officers opt for the smaller, municipal fine in 75% of the issued tickets in those 11 categories, according to numbers provided by the Cantrell administration. But now, officers will be encouraged to hand out the higher state fines, Cantrell’s Chief Administrative Officer Gilbert Montano told the City Council on Tuesday. Montano said that based on last year’s citation data, a switch to state fines would increase city collections by $1.2 million. If officers give out more tickets than in 2018, that number would grow even higher. During her mayoral campaign, Cantrell repeatedly promised to take down all traffic cameras if elected mayor, or at least suspend the program pending a comprehensive review. With her proposed budget, she is partially following through by removing 20 of 31 non-school zone traffic cameras and turning off school-zone cameras outside of school hours. Last week, Montano told the Council that removing those traffic cameras will lose the city $4 to $6 million in revenue. But at least one council member is worried that the city is simply making up for the removals with other enforcement tactics. Harrison said that the primary goal of the program is to increase road safety and reduce fatalities, not make up for lost funds. But Moreno was skeptical. When Councilman Jason Williams asked how many driving fatalities had occurred in New Orleans this year, Harrison could not say. A Louisiana State University traffic crash database showed 30 traffic fatalities in the city for this year as of this week. “I would hope that the number of traffic fatalities would be somehow part of the conversation to shift officers away from shootings, armed robberies, and sexual assaults,” Williams said. Montano said that the switch to higher state fines was intended to increase consistency in NOPD police reports. Bunton said he’s concerned with the arrests that he believes will inevitably result from the program. Part of that increase will come from illicit activity, such as drug possession, discovered during the stops. More arrests are also likely because many New Orleans residents have outstanding warrants or attachments that they don’t know about, according to Bunton. He said his office has been working to create venues that allow people to clear their records without the risk of arrest. Moreno also raised concerns over how this program could damage some of the trust the NOPD has built in an attempt to move towards “community policing.” She questioned whether there weren’t better uses of officers’ time, given the city’s high violent crime rate and understaffed police department. “I’m hoping the CAO will reconsider this,” she told The Lens. Another problem, according to Bunton, is that the program could exasperate existing racial biases in the criminal justice system. The problem has been a focus of the six-year-old NOPD consent decree — aimed at eliminating police civil rights abuses — which has placed the department under the supervision of a federal judge and a team of monitors. In a 2017 review of the NOPD, the consent decree monitors audited NOPD stops, searches, and arrests and found possible consent decree violations in 20% of police body camera videos they viewed. “This remains an area of concern,” the report says. A 2017 survey community survey conducted by the monitoring team found that 68.5% of residents either agreed or strongly agreed that NOPD officers harass people during stops. Harrison said the department would increase traffic stops by diverting overtime hours that would have otherwise been used to review traffic camera footage. In the long-term, he said that the increase in personnel, made possible by greater funding in Cantrell’s budget, will free up officers to take on regular traffic enforcement duty. The NOPD is slated to receive a nearly $12 million increase — to a total budget of $190 million — under Cantrell’s budget proposal. And Orleans Parish District Attorney Leon Cannizzaro’s office will see a $600,000 increase. That increase restores funds cut from prosecutors’ budget over the past two years, a major point of contention between Cannizzaro and City Hall. The DA’s total annual budget — including state funds and other sources — ranges from about $14 million to $15 million annually, nearly double the public defenders’ total annual budget. These raises are in line with Mayor Cantrell’s primary budget priority: public safety initiatives. Aside from increases to the police and city prosecutor’s office, Cantrell’s administration also plans to aggressively expand the city’s surveillance system and has budgeted $3.5 million to cover the salaries of the 18 employees who monitor surveillance footage at the city’s real time crime monitoring center. The public defenders’ office, unlike these other criminal justice offices, is not receiving any general fund revenue increase under the mayor’s budget proposal. Overall, the office is bracing for a budget decrease due to lower state funding and the removal of some city traffic cameras. The public defenders’ office receives $5 for every traffic camera fine. The press release noted that the DA’s general appropriation from the city for next year — $6.7 million — is slated to be almost five times the size of the Orleans Public Defenders’ — about $1.5 million. Bunton said Cantrell’s budget represents a reversal of slow but positive change towards a more balanced criminal justice system. Bunton said that his office is now facing a hiring freeze as well as possible furloughs and layoffs. “With the forecast right now, it’s that serious for us,” he said. Another major issue the public defenders’ office is grappling with is its ability to offer conflict representation. Conflicts in representation occur when multiple indigent defendants are facing charges stemming from the same alleged incident. It would be unethical, for example, for an attorney to urge their client to testify against an associate to get a better deal from prosecutors if the attorney represented that associate as well. For cases like this, the public defenders’ office must sometimes hire outside counsel to represent defendants. In 2016, The Advocate reported that these “conflict cases” made up 25 percent of the public defenders’ felony cases. And Bunton said these conflicts have only increased as the NOPD turns their focus to group crimes. Group prosecution grew under former Mayor Mitch Landrieu beginning with the establishment of the multi-agency gang unit in 2012. More recently, in August, the NOPD, along with state and federal agencies, executed a drug sting called “Operation Summer Heat,” during which investigators arrested 71 people in five days. 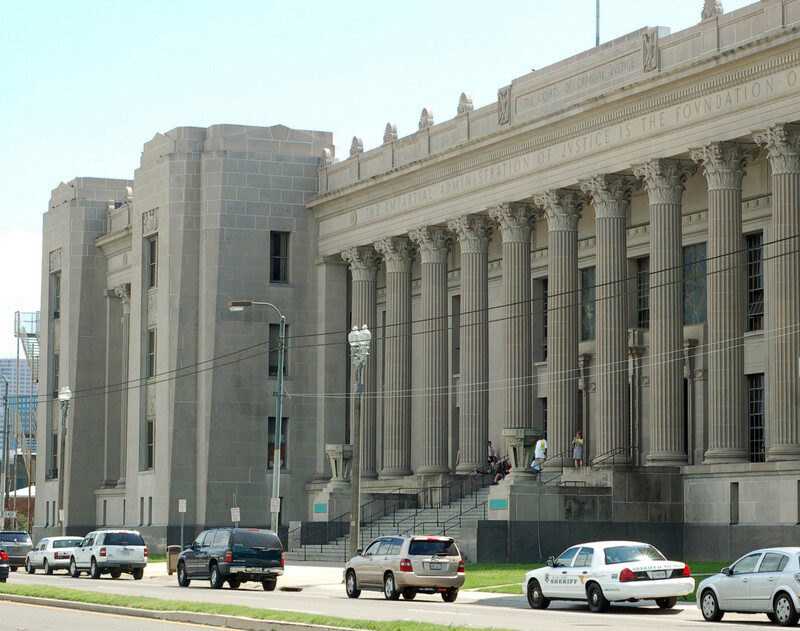 If the public defender’s office can’t afford new conflict cases, defendants will have to sit in jail for extended periods of time, raising the cost to the city for pretrial detention. If they’re held too long without an appointed lawyer, they will be released, Bunton said. Bunton gave these same warnings when his office faced a similar budget decrease in 2015 and 2016. His office initiated a hiring freeze and stopped accepting some new felony cases as a result, leaving dozens of defendants in limbo.